As the country goes to the polls, its military has a chance to make history. This weekend’s general elections represent a first competitive poll in 25 years* in Myanmar (also known as Burma), with a total of 1163 seats up for grabs. The elections are a test for President Thein Sein and the Burmese military, who have the opportunity to demonstrate that they have the commitment and political will to help move the country forward to democracy and fundamental change. Sworn into office in March 2011, President Thein Sein’s government has taken some remarkable steps towards change: opening up to the international community, including an effort to normalize diplomatic ties with the West, and inviting foreign investors following decades of isolation from the global economy. While this effort has produced some real successes, the apparent initial openness has been followed by various restrictions, with the result that Myanmar still ranks among the worst countries in the world in which to do business. Concerns that the country’s new market opportunities have been moving into the direction of mostly benefiting just a small privileged elite and their cronies have been corroborated by recent revelations by Global Witness on the $31 billion jade trade. Domestically, some reforms are very much in evidence: Political prisoners have been released; the media has been relaxed; civil society organizations, unions, and political parties have been allowed to form. However, a number of journalists have been arrested; student protests that sought education reform were crushed with force and many were imprisoned; and persistent military offensives against ethnic minorities have been launched. Even now, clashes continue in several areas, traumatizing and displacing thousands of civilians. This reflects both the policies of the present government and a broader political crisis that is deeply rooted in ethnic conflict. Weighted carefully, it is hard to conclude that in sum the indications point to anything other than backsliding. The peace process – formally launched on August 18, 2011, encompassed nearly three years of talks with more than nine formal negotiations between the government’s Union Peace Working Committee (UPWC) and the ethnic armed organizations’ Nationwide Ceasefire Coordination Team (NCCT). Although it produced some noteworthy achievements in the initial stages, ultimately only eight of more than twenty ethnic armed groups signed the so-called Nationwide Ceasefire Agreement (NCA) on October 15, 2015, well short of the nationwide agreement that was sought. The non-signatories refused to ink the agreement after the government rejected all-inclusive participation. This was despite the ethnic minorities making significant concessions earlier in the process: non-disintegration of the union, non-disintegration of national solidarity, and the perpetuation of national sovereignty (the three main national causes set by the former military regime). If Myanmar were to move in the direction of the envisaged second Panlong conference and negotiated political agreement, the process will need to be inclusive, open, equal, and democratic. As for the legislature, while adding insignificant provisions and making peripheral laws were allowed, any amendments that would change the country fundamentally were effectively vetoed by the lawmakers from the armed forces bloc. The Constitution still grants the military a quarter of all seats, while any substantial change requires more than 75 percent under the present constitutional design. In other words, Myanmar is as it was in 2008. When it became apparent that approach individual members of Parliament from the military was not possible, as they talk their orders directly from the commander-in-chief, democracy icon Aung San Suu Kyi proposed quadripartite talks, to include Thein Sein, house speaker Shwe Mann, and the military’s Commander-in-Chief Min Aung Hlaing. Parliament meanwhile suggested six-party talks. However, the president rejected both offers, and instead hosted meetings involving the 14 parties and then an even larger gathering of 48 stakeholders. Neither format allowed any serious or substantive discussions. Still, Myanmar wants democracy. How might that happen? Essentially, three things have to happen if the people of Myanmar are to enjoy true democracy. First, the Sunday’s elections must be free and credible, and the will of the people expressed through the elections must be fully respected by the acceptance of the results. Second, the NCA must be implemented in an all-inclusive process. And third, Constitutional reform must proceed. So this begins with elections that are unmarred by further violence, coercion, or intimidation, with the results respected. Then, the NCA must be implemented with a good-faith, solution-oriented approach. The military has a crucial role to play: opening up the process, working with the new government in recreating a space for all, including the non-signatories of the October 15 pact , and working together in molding the complexities into a simple federalist democracy, all within a reasonable timeframe. Finally, the 2008 Constitution must be amended. Why? Simply put, it is undemocratic. Evidence strongly suggests that independence hero Aung San did not intend to form the type of successive regimes that misruled the country for more than 60 years when he founded and led the Burma Independence Army (BIA), its members immortalized in the Bama or Burman nationalist mythology. The pre-independence Burman nationalistic movement was the means used to achieve independence. The subsequent implementation of that policy by Nu’s government, and the 1962 coup, which principally stemmed from a desire to protect the Bama chauvinistic interests from the influence of South Asians (the Burmans see them as second colonists), were a direct result of the misinterpretation of Aung San’s political strategies and goals. The counterproductive outcome was the formation of the Karen National Union and the Kachin Independence Organization. Myanmar must be rebuilt through economic strength based on democratic foundations. This will happen only when the necessary constitutional reforms are made (amending articles claimed to have been drafted on the basis of fear of foreign powers and the charter that gives the military an effective veto). To eliminate antagonism and possible fear of retribution, which could be taken as reason to cause instability and revert to the “dark days,” Nobel laureate and main opposition party leader Aung San Suu Kyi has throughout the campaign in recent weeks openly reiterated that she would prioritize national reconciliation and ethnic harmony by working together with the military, holding no grudges. That leaves the post-election period offering a historic opportunity for Myanmar, and the onus is on President Thein Sein and Senior General Min Aung Hlaing to ensure that the country moves forward to federalist democracy. In doing so, they would leave a distinctive legacy for Myanmar and its people. Salai Elaisa Vahnie is a long-time advocate for change in his native Myanmar and an observer of the ongoing reform process in the country. He holds an MPA degree in Policy Analysis and Comparative International Affairs from Indiana University Bloomington. 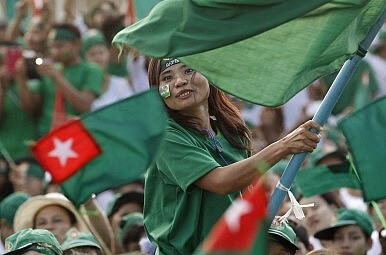 The elections provide an important confirmation of the direction of Burma’s democratic development.